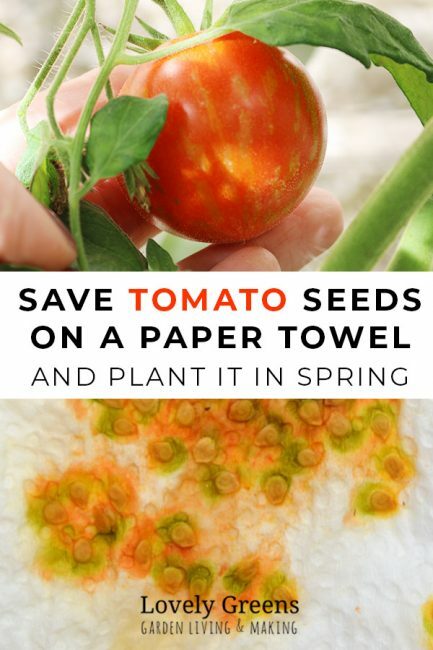 Tips on how to easily save tomato seeds on a paper towel and tips on planting them the following year. This method is the best way to save tomato seeds without fermenting them. Many people choose to grow tomatoes from small plants purchased inexpensively at the local garden center. It’s a great and easy way to grow your tomatoes but you’ll likely be limited to growing just a few of the most popular commercial strains. By growing from seed, you’ll be able to choose from hundreds of other varieties — you’ll be astonished at just how great the choice will be. 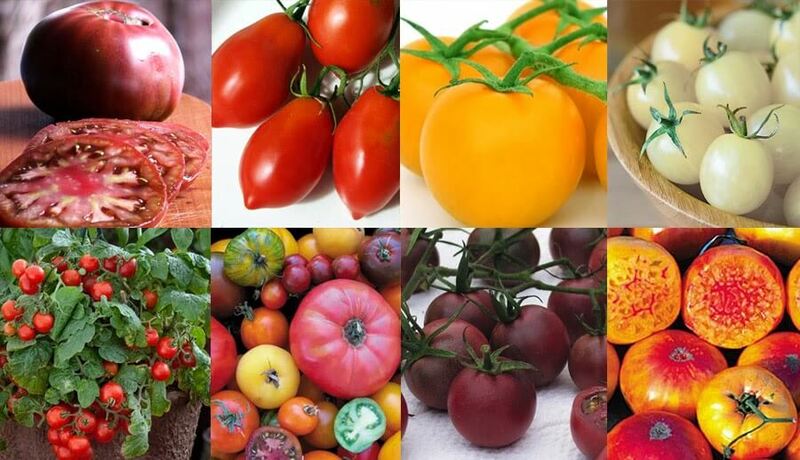 If you choose to grow heirloom tomatoes then you’ll also have the option to save seeds. It’s a lot easier than you’d think and the method I use can keep them viable for up to fifteen years. They’re also no-fuss, can be sent to friends through the post, and are fun to plant. Growing tomatoes ‘from scratch’ is a lovely way to see the whole process of seed to plant to crop. Saving the seed after starts the cycle anew. Firstly, a word of caution on saving vegetable seeds of any kind. If they’re not heirloom then the plants that grow from the seeds will probably not grow true to the parent plant. Most of the seeds available to the home grower aren’t organic and/or heirloom and often have F1 hybrid or something similar on the packet. These are perfectly fine to grow and eat and contrary to what you might have heard, they’re not genetically modified in a lab. F1 hybrid seeds are the result of breeding two different parents. For example a big red tomato with a small yellow tomato might give consistent offspring that are big and yellow. Unfortunately, the second, third, and any other generations from that crossing have all kinds of results. You might save seeds from your big yellow tomato and all your plants grow up to produce small red tomatoes. You never know. Saying this, there is a way to propagate F1 hybrids but it’s by taking cuttings rather than saving seed. Along those same lines, you’ll need to make sure that your heirloom/organic varieties don’t cross-pollinate. If you’re growing some heirloom tomatoes in a community garden and someone else is growing another variety then that can happen. Bees, wind, and other insects can bring pollen to your plants and the babies they make will be a mix of the two. You can hand-pollinate in these circumstances and protect the flower and fruit. Use a clean paint brush or tooth brush and then mark and protect the flowers after. When they develop into fruit save those ones for seed. For me, the easiest way to save tomato seeds is to scrape them out of the fruit and on a paper towel. Afterwards I spread them out to create space for the eventual seedlings to grow. 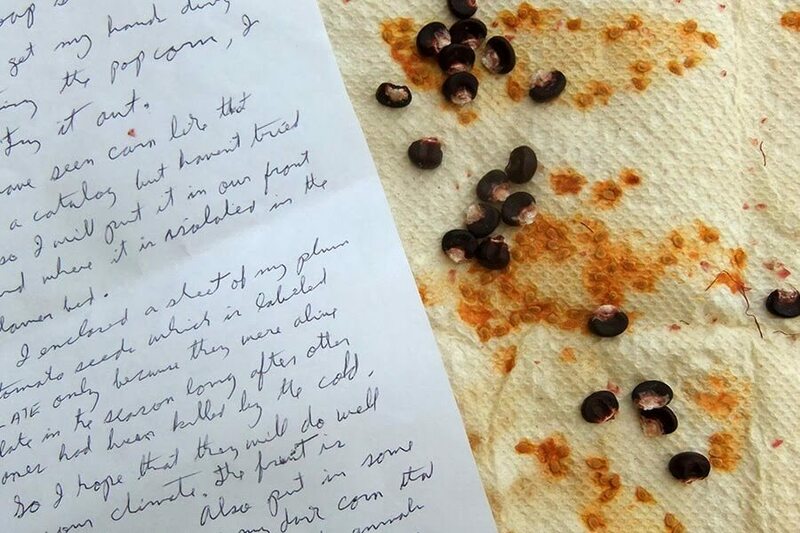 Let the seeds dry completely then fold the paper up and store it in an envelope with your notes written on the front. You can also write directly on the paper towel. Saving tomato seeds in this way also makes them easy to share among friends – in fact some of the seeds in this post are from a blogger friend who sent me some of his ‘Late Plum’ variety last year. When the time comes to start tomato seeds I use a pair of scissors and cut a square off the paper towel. This way you can save some of the seeds for another time. A really good idea in case you have a real winner of a variety and want to grow it again. When stored at room temperature, tomato seeds can still be highly viable even after ten to fifteen years. 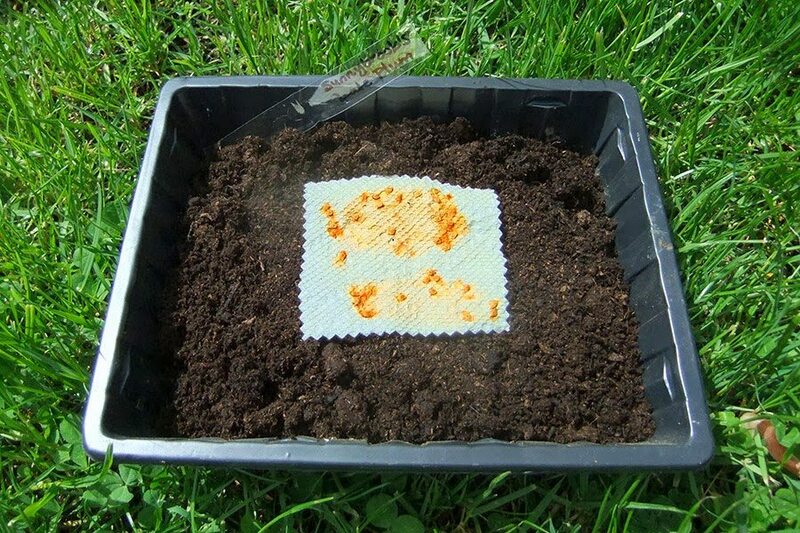 Once dried and saved, you can plant the whole piece of paper in compost. The seedlings will grow just fine, paper and all. It will eventually degrade into the soil but even if there’s some left when it comes time to prick out your seedlings, it will tear away easily. You’ll want to transplant your seedlings into individual modules when two true leaves have appeared. Growing tomatoes from seed isn’t difficult but you do need to start them early if you live in a cool climate. On the Isle of Man (Coastal zone 8) it’s practically impossible to grow them outdoors early in the year. If you’re in a similar climate, nurturing them in a greenhouse, poly tunnel, or warm windows is the best way to go forward. You can also get a seed starting propagator with a heat pad to help grow your seeds in a warm and controlled environment. For me, growing tomatoes begins in mid-February when I sow the seeds for my greenhouse grown plants. If you’re in the same climate as me but will be planting into unheated greenhouses, wait a couple months later. 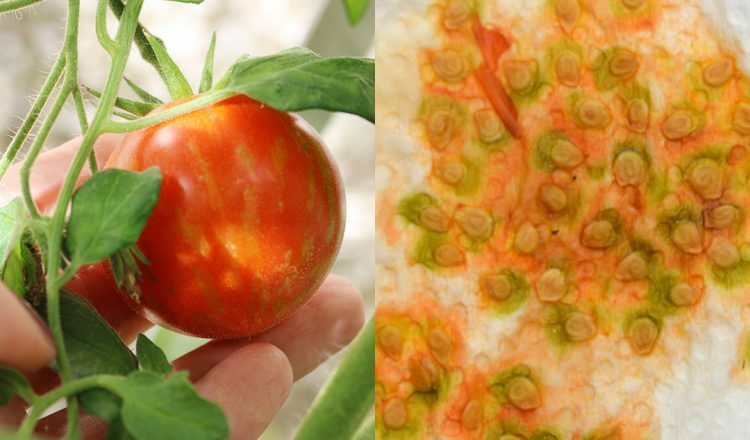 Our summers are also warm but not hot and we often suffer from Blight, a fungal disease that affects tomatoes. My tomatoes stay in the greenhouse all summer for both protection and its warmth. It seems like a lot of work but nothing beats the taste of a sweet and juicy home-grown tomato. To start your seeds this early you’ll need to do it in a warm place with plenty of light. 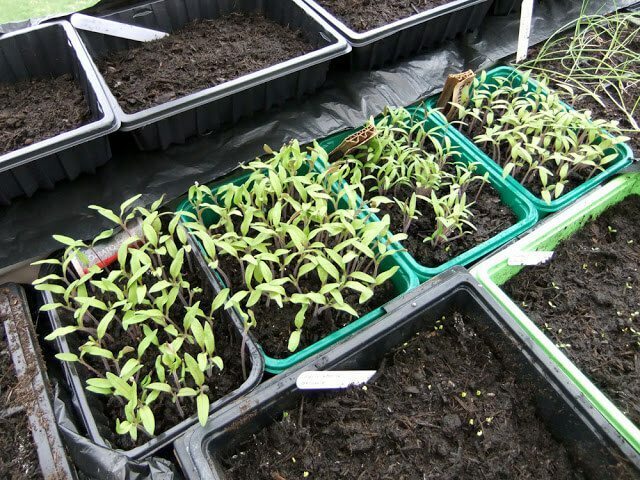 Bottom heat is preferable and if you don’t have a propagator then setting the tray of seeds near a radiator works well too — just make sure it isn’t too hot and that the compost stays moist. Popping the tray into a clear plastic bag also helps in both retaining heat and moisture. Use multipurpose or seed-starting compost and the rule of thumb in sowing is to cover the seeds with soil twice the depth of the seed itself. So if the seed is 3mm in length (the size of a tomato seed) then cover it with 6mm of soil. Sprinkling a light layer of horticultural grit on top helps the compost to retain moisture and won’t bother the seedlings at all. Tomato seeds germinate best at around 70-80°F and in this temperature you can expect to see green shoots within 6-8 days. 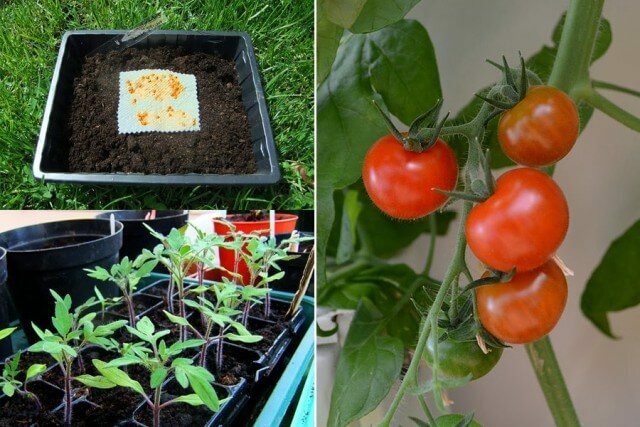 If you’re growing a tomato plant, heirloom or even a F1 hybrid there IS another way to keep the plant going year after year. This way is a little more involved but the plants you create will be far ahead of any that you grow from seed. If you’re intrigued, head over to my piece on how to propagate tomato plants from cuttings. Here it is my advice: If you have a favourite open pollinated tomato do yourself a favour and save some seeds. Then you’ll be able to enjoy them every year! Thank you for sharing this … I love growing tomatoes in my home garden. Growing from seed is super easy and fun to do for all ages. I love how you include a seed saving link at the end of the post. See you in the garden! No summer is complete without tomatoes! Thank you for the tips! I grow in a cooler climate and am considering a heated growing venue of some type. Greenhouse? Conservatory? Love the idea of tending my tomatoes in that type of environment. There was a time when i did this Tanya, but the wind blew all the glass out of our greenhouse in a storm and we have never replaced it. We are too far North to grow them outside, so we don't grow them any more – but I have yet to find a tasty shop bought one. Store-bought are very sad indeed…I wonder if a local Farmers Market might have some tomatoes for you in the summer? I am DETERMINED to have more success with tomatoes this year. I was going to experiment with a few different ways. Some will stay contiunally in the greenhouse in grow bags. Some will come outside in pots and some will be outside straight in the ground and I will see which do best. You all right save our own seeds is much cheaper and more interesting. Thanks for the tips. Some great tips Tanya, thank you. It's almost time to start sowing! Seed saving is something I'm hoping to do this year, provided I get some good tomatoes. Hey I recognize those seeds! I hope you get them to produce this year, I will be starting mine much later than you and some actually come up in the garden by themselves. We have mud here now so it will be a long wait until plowing again.